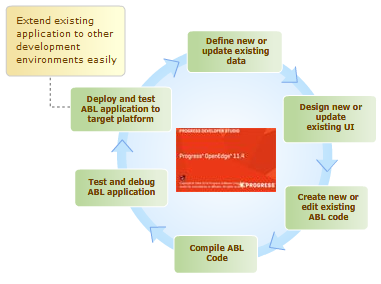 Getting Started Guide: The purpose of this guide is to provide an introduction to the functionality and features of Progress OpenEdge Application Development Platform. It is intended for programmers who are new to the OpenEdge platform. Task Maps: Task maps provide a visual representative method to locate information about performing key tasks related to OpenEdge Platform. Cheat Sheets: Cheat sheets are provided as guides for completing complex procedures in the Eclipse Framework. Videos, Webinars, and Tech Tips: There are a variety of vidoes, hosted on the PSDN website, that illustrate the features of OpenEdge Platform. FAQs: Frequently Asked Questions, hosted in the Knowledge Base portal. You can download the latest version of Progress OpenEdge product available in the Progress Download Center. You can search for any term or a phrase in the OpenEdge documentation set using start.pdf. To do this, you must first download the entire OpenEdge Release documentation set in PDF format. What value should -B be set to? How do I increase the memory of the AdminServer? How do I replace single quote character?